The badge of Grammy nominated band is a proud one to possess and Della Mae wear theirs with great pride as they pursue the path of wider recognition. 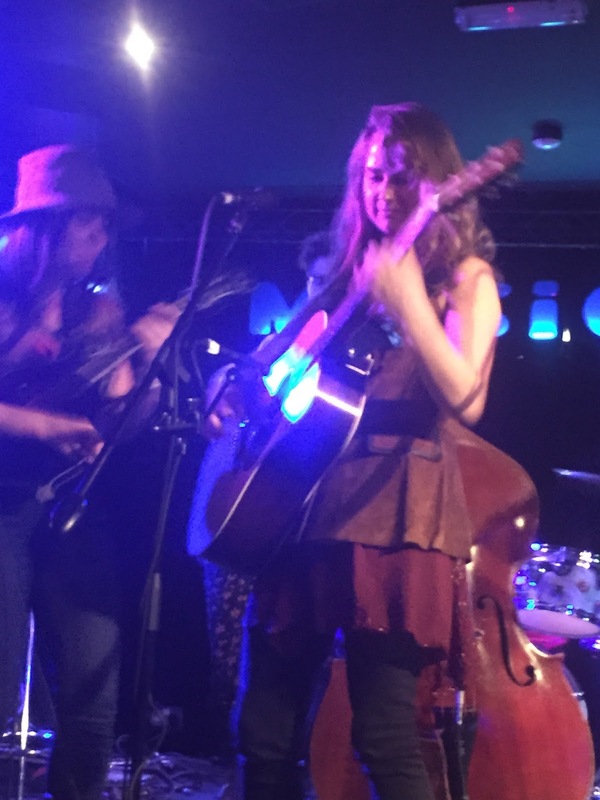 However this path is made a lot smoother when you’re one of the hottest bluegrass bands around, although Della Mae add loads more to the tag of that particular music style with a full on live show exploring many facets of the roots spectrum. 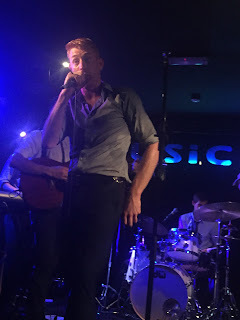 Quite simply they have to be one of the strongest acts to make their UK debut this year and without a shadow of doubt, music followers will instantly fall in love with their infectious and outstanding live show which made a fleeting but memorable visit to The Musician in Leicester. Now the owner of three impressive albums following the recent release of their self-titled latest effort, this five piece combo may spread themselves across the States in location, but when in unison they effortlessly twist the natural talent from the ingredient pool into a spectacular concoction of roots music. 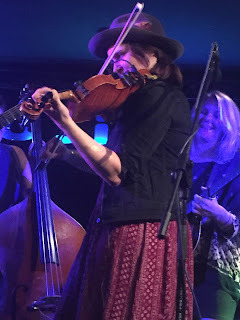 Vivaciously led by front person and main vocalist Celia Woodsmith, a high degree of fraternity explodes from the stage with fiddle, guitars, banjo, mandolin and bass, playing their part to illuminate a growing roster of exquisite songs. Forever in harmony, Celia though occasionally steps back to allow Jenni Lyn Gardner (mandolin, vocals) and Courtney Hartman (guitar, banjo. Vocals) take lead, while the prodigious and acclaimed fiddle talent of band instigator Kimber Ludiker injects finesse and class into every part, whether solo or accompanied. Not forgetting the steadying and critical input from the newest band member Zoe Guigueno on stand-up bass and the complete package is assembled to wow a spoiled audience. Not surprisingly for this first Della Mae UK tour, the band announced that they would be focussing on the new album, but as the ninety minute set evolved there was plenty of the Grammy nominated 2013 record THIS WORLD OFT CAN BE showcased as well and brisk sales of both CDs during the gig highlighted their dual appeal. 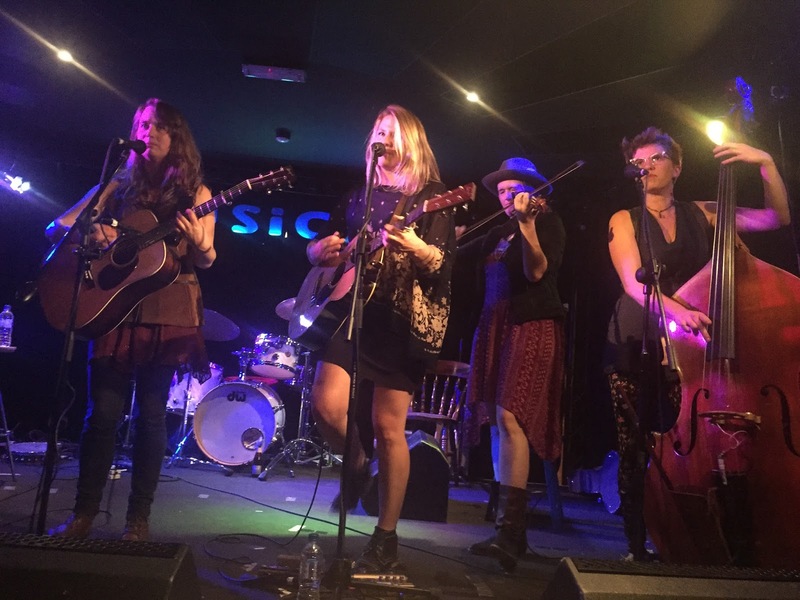 Although new to the UK, Della Mae are a well-travelled band as per their role as US music ambassadors which has included visiting fifteen countries last year as part of the State Department’s mission to spread the cultural word. 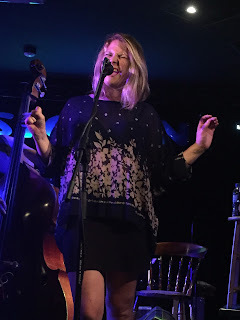 The song ‘Long Shadow’, performed and co-written by Courtney, had its origins in Pakistan and was one of the tracks featured from the new album. Other occasions where Celia took a back seat included the singing of ‘Pine Tree’ by Jenni, who provides the southern influence through her South Carolina background, and a couple of fiddle tunes spearheaded by Kimber, namely ‘Nail That Catfish to a Tree’ and ‘Cartier’. While being excellent writers, the band are not averse to featuring the works of others and have included a cover of ‘No Expectations’ by the Rolling Stones on the new album. This track closed the main set before the band returned for an enjoyable bluegrass take on the Everly Brothers standard ‘Wake up Little Susie’. One of many highlights from this superb night of entertainment was Celia pouring her heart and soul into a version of ‘Woman Be Wise’ and adding lineage to a song previously graced by Bonnie Rait and Sippie Wallace. Of the band’s own compositions, ‘Boston Town’, the location of Della Mae’s inception, and the gospel influenced ‘High Away Gone’, complete with blistering harmonies, provided a lasting legacy from seeing the band for the first and certainly not for the last time. Right from the off with the gripping tune ‘Empire’, Della Mae set their stall out to be a band a cut above the rest. Not content on booking one passion-filled roots band, the organisers asked rising UK rebel rousers CC Smugglers to open the show and their high energetic and instant impact take on acoustic music brought a busy venue literally to its feet. 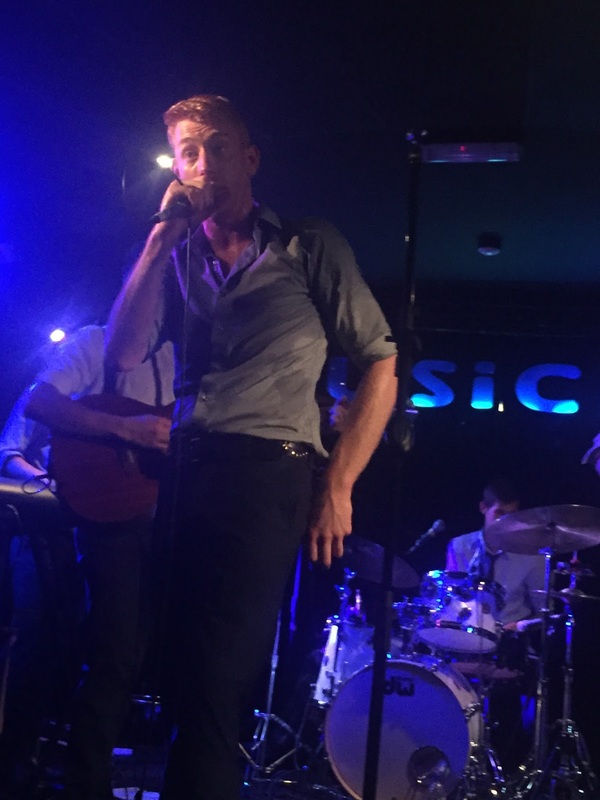 Led by lively lead singer Richie Prynne, it wasn’t too difficult to see why they are a highly sought after festival band and portray a hard working attitude to extract every ounce of old time musical spirit from their youngish souls. While their music is probably in developmental stage, the live show is profoundly tuned and work should not be in short supply for a focussed and studious band, explicitly blazing that good time trail. Likewise, it would be an amazing and an unjust situation, if Della Mae did not leave a startling impression on this initial trip to our shores. The very notion that artists like these can leave the comforts of homeland adulation to test the overseas market is a testimony to their drive and ambition. 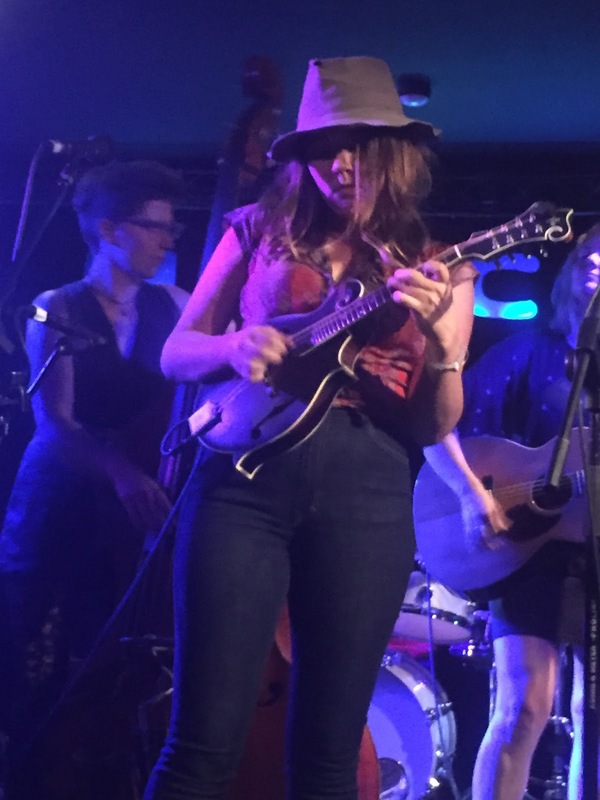 Della Mae possesses plenty of this and it was an absolute privilege to witness their mastery close at hand.